OK, for those of you who are tired of looking at our carpet, here I am. We're in Ohio at Scout Camp, and getting things set up. We're just waiting for our house to sell, then we'll buy a different one. The kids start school day after Labor Day, so they haven't missed anything yet. We do have a phone at the camp, but our cell's are out of range. Call my mom if you need the number. Or call my cell, and leave me a message. I can pick them up when I go into town. Eme and Joe start school the week after the big kids. They have preschool 2 days a week. Pretty handy. Things are good, and we're enjoying the ruralness of it all! Take care, and I'll try and post some pics in the next week or so!! Sounds good. Hope the house sells soon. Hang in there. . your are awesome as always! Glad to see your post! Been wondering if you had made it there. How far are you from the schools? Yeah!! I tried so many times to get this to work and I could never get to your blog. I just "accidentally" did it! I can not believe your kids. No way. They are all grown up. AND you look just like the super-model that I know you are. 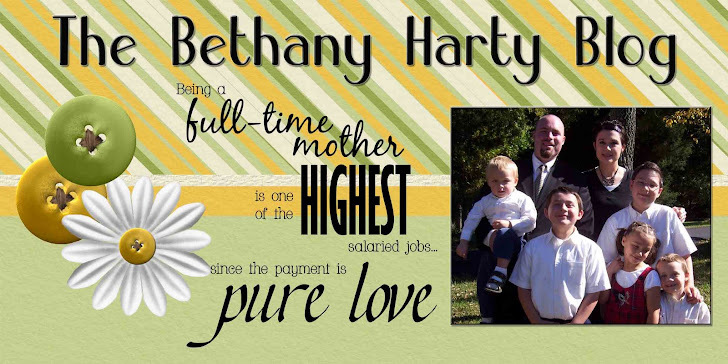 Bethany Harty, you really are such an inspiration. I do not know how you do it and always with a smile on your face. You are inspiring. I miss you and your family. I am so happy to hear though that things are going in the direction that you want them too. Do you think that direction will ever be back here to Oregon? Write when you can... I've said it many times, but it is so true - you are a TROOPER! PPS - Athena starts HIGH school on Wed!